Tackling bureaucracy and reforming the tax and subsidy systems are necessary to improve the economic conditions and to reduce the high unemployment rate. The current government coalition of national unity still remains shaky and prone to tensions. Consisting of both secular and (moderate) Islamist parties it lacks ideological cohesion, which hinders effective decision making and reform progress. The main secular alliance in parliament, Nidaa Tounes, is affected by continuing tensions about leadership and policy direction. The May 2018 municipal elections saw a low turnout below 40%, reflecting widespread disillusion among voters due to the tense economic situation and the lack of political and economic reform progress. The internal security situation is still tense and the risk of terrorist attacks remains elevated. Countering this threat while maintaining democratic freedoms is a major challenge. Social dissent remains high, reflected in frequent protests and strikes that disrupt business operations and negatively influence the investment climate. However, it is not expected that protests will easily lead to widespread unrest and a threat to democracy in the short-term. 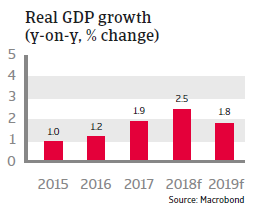 In 2018 and 2019 GDP growth is expected to remain moderate (2.5% and 1.8% respectively) and insufficient to substantially reduce the high unemployment rate of over 15%. 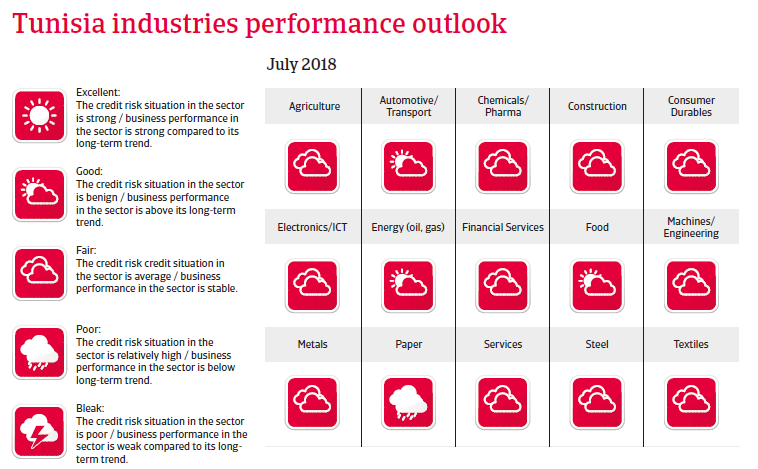 Slow reform progress and social tensions continue to weigh on the medium-term outlook, while economic expansion remains heavily dependent on the security situation. Inflation is increasing in 2018, driven by higher food prices and a weakening of the currency, negatively affecting households’ disposable income. Further interest rate increases by the central bank to combat inflation could adversely affect growth. The financial sector remains weak and the level of non-performing loans high. The budget deficit is expected to decrease only gradually in 2018 and 2019, guided by an IMF programme (in May 2016 the IMF approved a four-year Extended Fund Facility arrangement worth USD 2.9 billion). 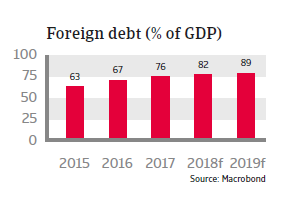 Public debt increased to 70% of GDP in 2017 and remains vulnerable to exchange rate fluctuations due to the high foreign currency denominated share of about 65%. Reforming inefficient public institutions and containing the enormous public wage bill (which amounts to 70% of primary current spending) are key fiscal reform priorities, and some austerity measures have been implemented to do so. The Tunisian government has announced it will cut fuel subsidies and hold off public wage increases. However, austerity measures meet the strong resistance of the powerful labour unions and so far IMF program implementation has been weak. 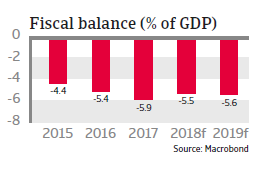 Any missed IMF disbursement could have a large impact, as Tunisia is heavily reliant on international assistance to finance its deficits. 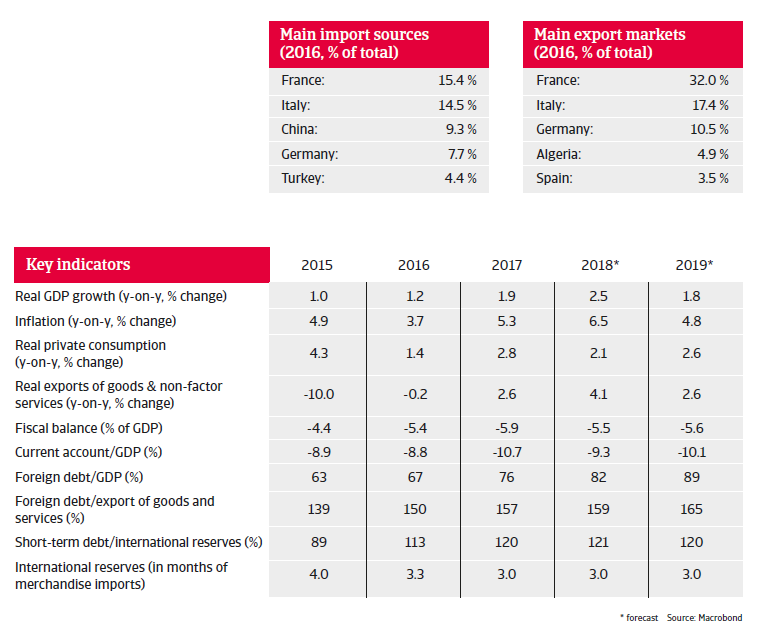 Tunisia´s external position also remains vulnerable, with high annual current account deficits of about 10% of GDP. Foreign exchange reserves decreased to a minimum import cover of three months (insufficient to cover the large gross external financing requirement), and the country will remain dependent on multilateral support for the time being. In order to improve external competitiveness and reduce pressure on reserves the central bank agreed with the IMF to accelerate the depreciation of the managed exchange rate (basket of mainly euro and USD) and to intervene less. More structural reforms are needed to accelerate economic growth and to reduce the high unemployment rate. Tackling bureaucracy, reducing corruption, and reforming the tax and subsidy systems are necessary to improve the economic conditions.